After reading French Kids Eat Everything, Mira reached out to me by email. We shared so many ideas in common! She ended up being one of the ‘test families’ for my new book. I’ve been inspired by her reflections on similarities between the Montessori philosophy and the French approach to food education. Thanks Mira! 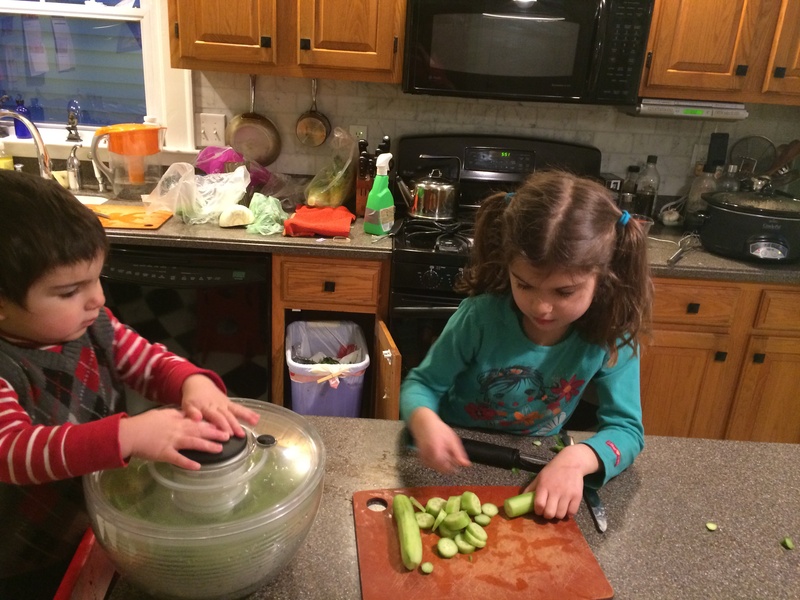 My family was one of the test families of Karen Le Billon’s cookbook Getting to Yum, and as we’ve worked through the recipes, I’ve been reflecting on the similarities between “French eating” and Montessori education, especially the approach to food. My daughter attended a Montessori preschool, and I’m currently writing a dissertation on the parent communities at two urban public Montessori schools in Connecticut. So while Karen calls these ideas “French”, they’re similar to techniques practiced at 21,000 Montessori schools worldwide. Here are some of the main ideas I’ve taken from both of Karen’s books and the Montessori schools I’ve observed. Children at Montessori schools generally eat in their classrooms, allowing them to skip the noisy school cafeteria. But this isn’t scrunched eating at your desk. In many schools I’ve observed, the room is transformed at lunchtime, and students play an integral role in the set-up and clean-up rituals, gaining ownership over their meals. I’ve watched a preschool class of boys spend half an hour setting the table for their classmates, figuring out how to work cooperatively in creating elaborate arrangements and rearrangements of the plates and silverware. Like the French preschools profiled in French Kids Eat Everything, in the Montessori schools I’ve observed, children eat off real plates and glass cups with metal silverware using cloth napkins. Montessori students also practice pouring exercises in a progression of different pitchers until 2 and 3 year olds are able to pour on their own and serve themselves snack. We did this exercise at home with my two year old and he can now mostly pour on his own. Even young children can learn to treat breakable objects with respect. With some guidance and careful observation, children learn to gauge the weight of glass cups and learn how to properly put them down on the table. 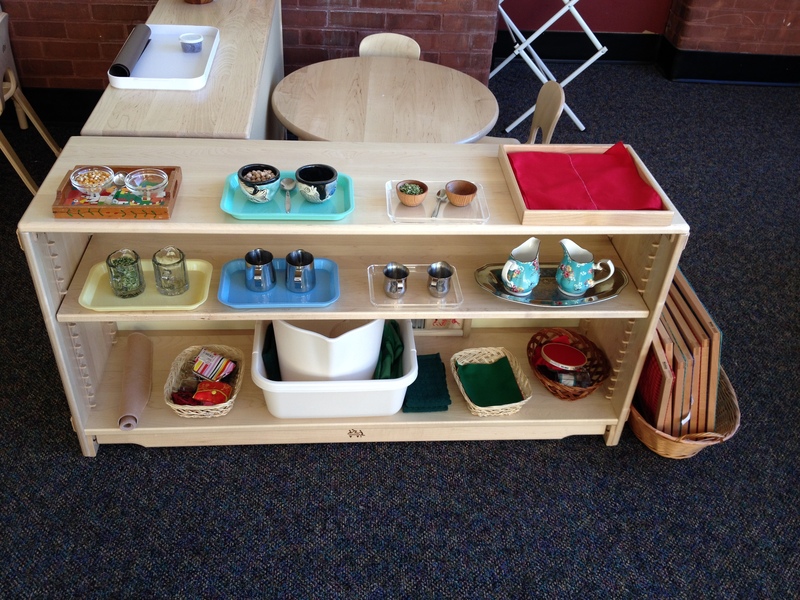 I especially like inexpensive small Ikea glasses – some will get broken in the learning process! But in the long run, children can skip things like “sippy cups” and plastic plates all together in favor of real (although child-sized) tableware. When we empower young children to handle real materials carefully, we create a foundation of care and responsibility that will last a lifetime. Your child will eventually want to drive your car! Start by giving them independence using smaller objects like glasses and plates. When children spill, instead of getting angry, I’ve heard a Montessori teacher say, “I see lots of water on the floor. What do we need to do when we spill?” The child gets a rag and begins cleaning up and the teacher helps. “Do you see more water on the ground? Let’s get it!” Similarly, when my children spill at the table, I hand them a rag and we wipe it up together. And then I think about putting less water in a cup or a pitcher next time. Through this process, children learn it’s natural and normal to make mistakes. This process helps cultivate experimentation and self-esteem. I’ve learned that the best way to get dinner cooked is not to send children to the living room to play with their toys, but ask them to get involved. For my two year old, that might be washing some Tupperware in the sink or pushing the salad spinner, and my 6 year old has started to peel and slice the cucumbers. Sara Cotner’s cookbook Kids in the Kitchen: Simple Recipes that Build Independence and Confidence the Montessori Way (http://www.amazon.com/Kids-Kitchen-Independence-Confidence-Montessori/dp/1477542043) gives more suggestions for including children as young as 18 months in cooking. I’ve learned to put vegetables out first without other choices. He won’t eat much that’s green at the moment, but will enthusiastically eat a plate of cucumbers while we prepare dinner. Though I didn’t do food in courses before, I’ve observed that he is most likely to eat pureed soup if there is nothing else on the table to distract him. Similarly, I keep trying and trying again to offer him new foods. One day he was suddenly willing to bite into an apple. After hating citrus fruits forever, another day he started peeling clementines. Next hopefully he will start to eat them! Much of the credit for my children’s evolving eating habits is due to the fact that they’ve been able to attend a wonderful childcare program in Hamden, CT called Alphabet Academy which has a pioneering meal program under the direction of master Chef Kim Kim. The menu changes weekly and each meal is served family style at child size tables with real plates and silverware. Alphabet Academy also tested recipes from Karen’s cookbook, and discovered that the children’s absolute favorite was…Spinach and Salmon Lasagna. Surprised? We all were too. The Montessori approach can be done with any task, and involves breaking the task down into a series of manageable steps. Similarly, Karen’s approach to eating in Getting to Yum offers a step-by-step technique for creating a palate by moving from simple pureed soups to more complicated iterations of a particular vegetable or fruit. The philosophy, whether French or Montessori, is clear – all children, with preparation and practice, can become happy and healthy eaters. 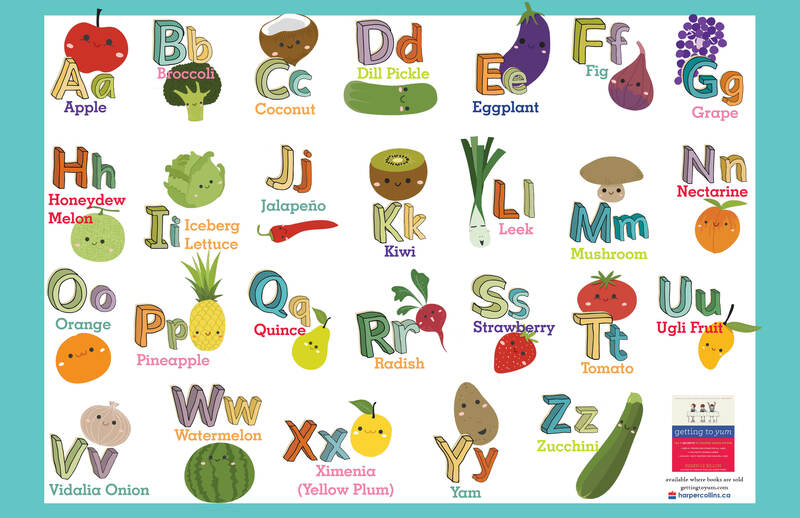 What about using the ABCs to teach your kids about fruits and vegetables? They’ll get a kick out of the funny ones in here. Download a black and white or colour version! 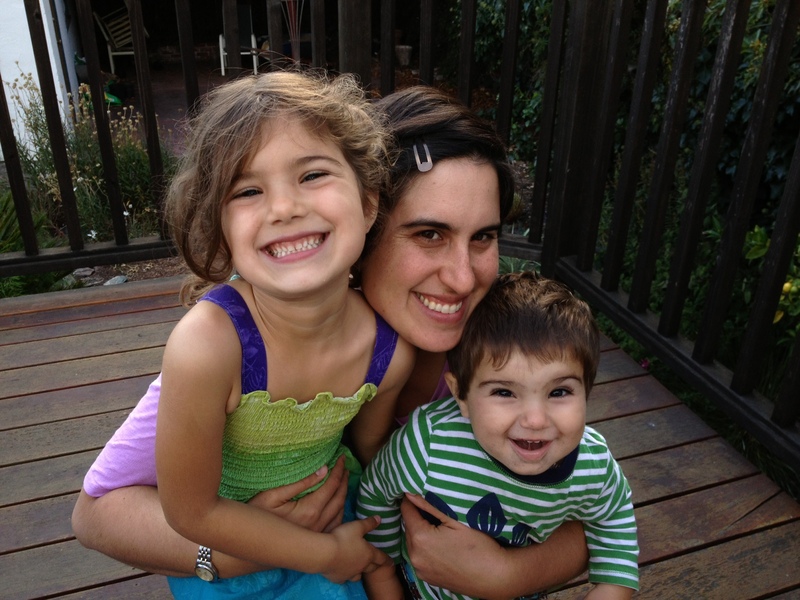 Melanie Potock is an amazing speech pathologist and ‘real food’ advocate for kids (check our her blog mymunchbug.com). I was so excited when she agreed to write this super helpful guest post. Thanks Melanie! As a pediatric feeding therapist or “food coach for kids”, I was smiling as I read Karen Le Billon’s new book, Getting to Yum. Truthfully, it was more than just a happy look on my face, I have to admit I was downright giddy. Nothing makes me happier than helping children become more adventurous eaters in a fun and family-centered way. That’s exactly the theme in Getting to Yum: Involve the whole family in taste-training games and help kids tune into the joy of discovering new foods! But what’s a parent to do if their child is a sensitive eater and gags at the slightest taste or touch of a new food on their tongue? While gagging isn’t life-threatening (read Karen’s description of gagging vs. choking) it certainly is an unpleasant reflex that reinforces one thing: NOT eating. If a child gags enough, it leads to vomiting. Enough said. We don’t want to go there. Start with a pea-sized bite, preferably cut into a cube. The cube shape helps kids feel the food in their mouths because the edges provide more tactile input and is easier to control. Chew HARD! Hesitant eaters chew hesitantly. They lightly tap their teeth on the surface of the food and consequently let it fall onto the tongue – and then they gag. Like a dinosaur, chew hard! With my younger clients in feeding therapy, we pound the table with our fists when we chew a brand new food to ensure that we are also chewing with force. This deliberate chewing provides the proprioceptive input that tells our brain exactly where the food is in our mouth and thus, decreases the tendency to gag. Pick up a glass of water with a STRAW. As adults, when we reach for a glass of water while eating a meal, we swallow much of the food in our mouths before the rim of the glass reaches our lips. To teach this learned behavior, a straw in the glass will help your child close his mouth and propel the chewed food backward to the throat to be swallowed. Take another small sip to hose down the tongue. The straw also acts like a garden hose, washing any tickly spots on the tongue and signaling the brain to swallow again. In fact, it’s impossible to swallow and gag at the same time. 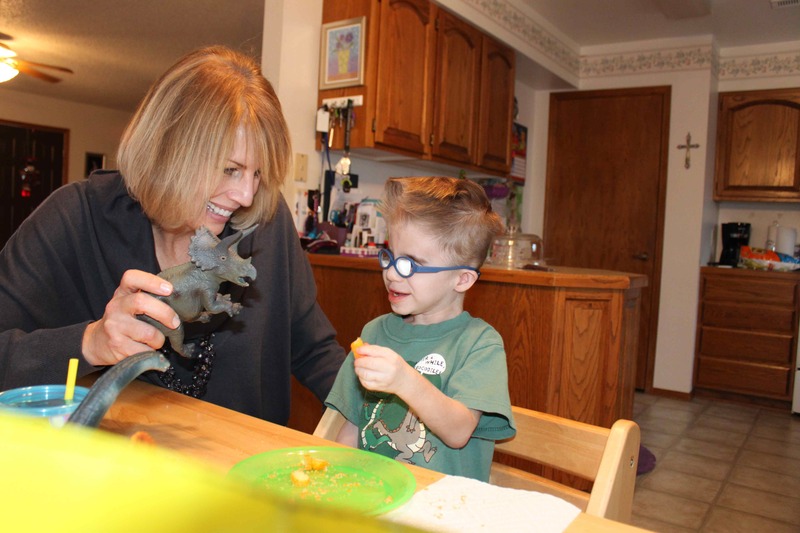 Whether your child is a garden-variety picky eater, an emerging foodie or perhaps a child with special needs who is in feeding therapy, always focus on what your child CAN do and progress from there. Once the pea-sized bites are swallowed with ease, progress to bean-sized bites until eventually your munch bug is tasting a comfortable, age-appropriate bite and asking for more. This same strategy can be implemented with toddlers or teenagers, but let’s face it – it’s probably best to forgo the dinosaur language at that point. Just remember to take it step-by-step and follow the Getting to Yum guidelines for keeping it fun! 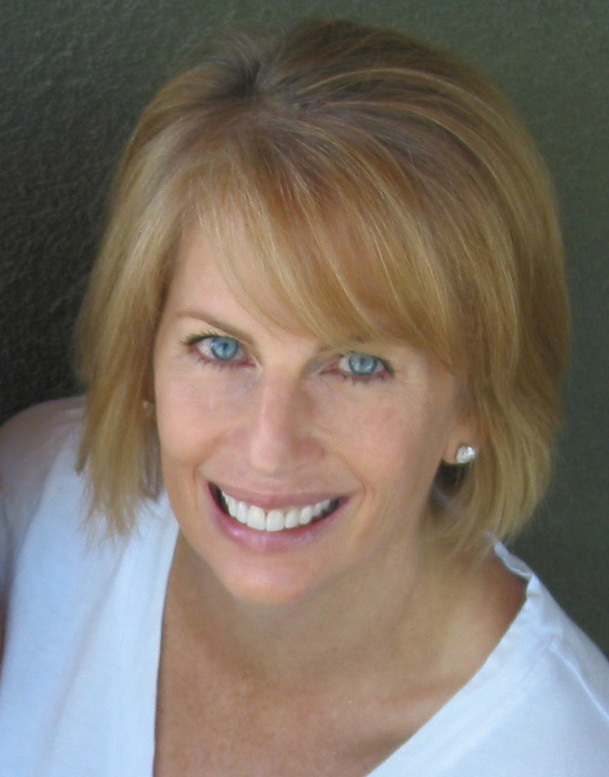 Melanie Potock, MA, CCC-SLP is a certified speech language pathologist, an international speaker on the topic of picky eating, and the author of the award winning parenting book, Happy Mealtimes with Happy Kids: How to Teach Your Child About the Joy of Food! With over 18 years’ experience treating children with feeding difficulties, Mel’s approach to developing feeding skills includes the fundamentals of parenting in the kitchen, such as how to avoid mealtime debates and creating more joyful mealtimes, even with a hesitant eater. Mel embraces her work with families with an open heart and a touch of humor. After all, the journey to more adventurous eating should be celebrated each step of the way! She has also produced the award winning children’s CD Dancing in the Kitchen: Songs that Celebrate the Joy of Food as a tool to keep mealtimes joyful and family centered. Connect with Melanie at My Munch Bug on facebook and twitter or email her at Melanie@mymunchbug.com. Grated carrot salad — French style! Several readers have written to me asking for this recipe. Enjoy! Grated carrot salad is a favorite dish for French kids. They eat it regularly for school lunch, and it’s popular at home as well. Even adults enjoy it as a starter. As a testament to its popularity, you can even find grated carrot salad pre-packaged in supermarkets (as one of the few salads which you can buy pre-prepared). The fresh version is infinitely better, because the secret of this salad is in the texture: finely grated raw carrots that are simultaneously crisp and melt-in-your-mouth. They more finely grated the carrots, the more the natural sweetness of the carrots will dominate the flavor of this dish. For kids who have a hard time with crunchier textures, this might just be the dish that convinces them they love carrots. Dressing: Mix the orange and lemon juice with the olive oil and the salt. Store separately until just before serving. You may want to add more oil, or lemon, depending on your tastes. But don’t overdress this salad! It should be nicely coated, but not swimming in the dressing. Carrots: Peel the carrots. This is important, because the skin is often more bitter than the interior! Grate the carrots in fine shreds using a hand grater or machine. (These food mills are popular in France, and make fine, delicate shredded carrot—if you have one, use it!) The finer the strands, the more delicious the salad. Parsley: Chop a quarter bunch of flat leaf parsley, in fine, small (I mean teeny, tiny) pieces. Make sure you don’t include any of the stems—just the leaves. Note: you don’t want dried parsley, as the fresh parsley offsets the texture of the carrots perfectly, whereas dried parsley tends to taste a bit crunchier and, well, dry. Combine the carrots, parsley, and dressing just before serving. Best served slightly chilled or at room temperature. Ps Funny French Fact: Carrots are one of the few vegetables that French people regularly eat raw. For some reason, they tend to prefer most of their vegetables cooked (raw broccoli, even when served with a ‘vegetable dip’ is not something my mother-in-law approves of, for example!). I’ve never found a satisfactory answer to the question of why this is so. If you have an explanation, let me know! France has one of the lowest rates of child obesity in the developed world, and is the only country in which child obesity rates have remained stable in the past decade, in stark contrast to the rapidly rising rates elsewhere. 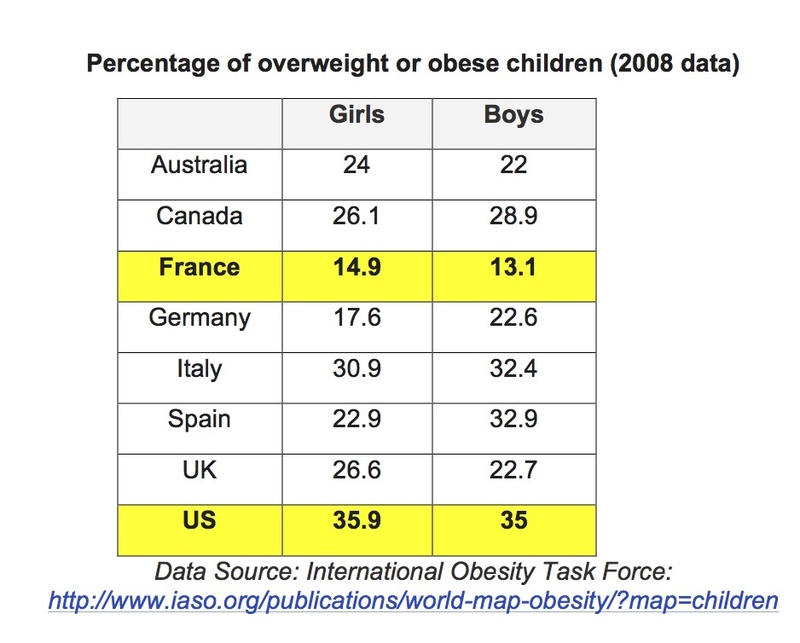 In fact, American kids are three times more likely to be overweight than French children. And while child obesity rates are rising quickly in many countries, they have remained unchanged in France for over a decade. Why? It’s certainly not because the French know more about nutrition than we do. A survey earlier this year revealed that the French know much less about basic nutrition than we do (for example, 40% of French people didn’t know the fat content of whole milk, versus 4% of Americans). The French are also less anxious about food than Americans, as Paul Rozin (a University of Pennsylvania psychologist) and Claude Fischler (a French sociologist) found out when they collaborated on a series of cross-cultural surveys. Of the four countries surveyed (the US, France, Japan, and Belgium), the US stood out: Americans tend to associate food with health, not with pleasure, and worry more about food than people in any other nation surveyed. When shown a picture of a chocolate cake, the most frequent responses from Americans were ‘guilt’, and ‘calories’. The French response: ‘celebration’ and ‘pleasure’. The French associated a picture of ‘heavy cream’ with the word ‘whipped’, whereas the Americans described it as ‘unhealthy’. This ‘pleasure principle’ complicates an already heated debate about the ‘French paradox.’ In a nutshell: French adults spend twice as much time as Americans eating, and they consume dairy and meat products in large quantities, yet are less overweight or obese, and have lower rates of heart disease than Americans. Various explanations have been offered: smaller food portions, less snacking, cigarette smoking (although rates have declined substantially in recent years), and red wine consumption. Whatever the explanation, this seemingly unfair fact of life is unchanged: the French, it seems, can truly have their cake and eat it too. The way French kids eat is equally paradoxical. French children spend one hour more per day eating than American kids do, partly at the expense of ‘screen time’ (they get, on average, 2 hours less per day). In the ‘classic’ French household (and I’m aware I am over-generalizing here), children eat the same food the adults do–and are expected to do so uncomplainingly. The (admittedly anecdotal) proof can be found in the lunches served in French schools every day: French school children regularly eat things like radishes, grated carrot salad, endive, all sorts of fish, and even stinky blue cheese and grilled guinea fowl (see the amazing school lunch menus I documented for a year in French communities of all sizes at the French Kids School Lunch Project). Most astonishing of all (as I can attest, being married to a Frenchman, and having our two daughters attend school in France): French kids not only eat this food, most of them like it. Why? In part, it’s because French school lunches are used as a pedagogical tool, introducing a broad range of dishes, fresh vegetables, and fruits. Strict Ministry of Education regulations ensure that fried food is served no more than once per month, children drink only water at lunch; instead of flavored milk, traditional cheeses or yogurts are served. Ketchup is served a maximum of once per week–and only with foods with which it is traditionally used as a condiment, such as steak. Portion sizes are limited (one piece of delicious baguette per child, at my daughters’ school). And vending machines are banned in all schools. Yes, that means no soda pop, no processed food, and no fast food. Kids learn to like the taste of ‘whole food’. This doesn’t mean deprivation, but rather moderation: sweet treats (like Cherry Clafoutis in cherry season, or Chocolate Mousse) are served once a week. So French kids learn to ‘treat treats as treats’, to use Michael Pollan’s phrase. The French example suggests that part of the answer to our obesity epidemic lies in food culture: the routines, rules, and rituals through which we teach our children how and why (as well as what) to eat. French teachers and parents believe that children can be taught to eat—just like they are taught to read. And they believe that this is one of the most important skills acquired in early childhood. So they have a series of teaching tools and techniques, built into common-sense routines, that they use at home and at school, to teach children to eat well. 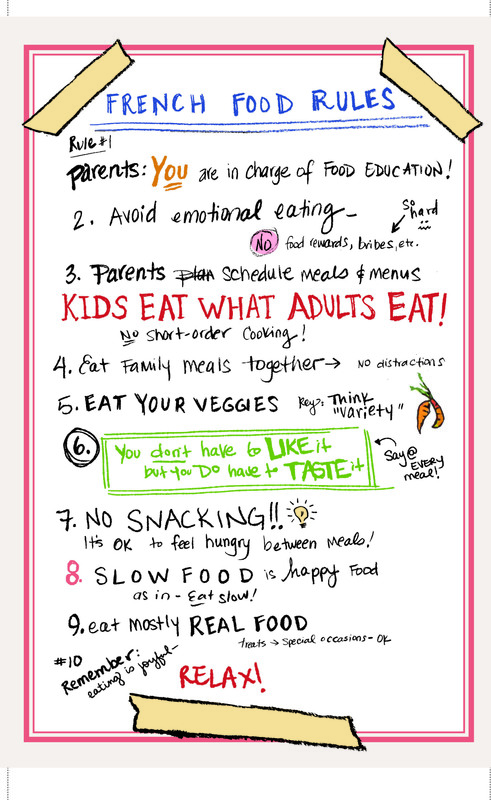 I summed these up in my book French Kids Eat Everything as the ’10 French Food Rules’: healthy eating routines which govern how as well as what French children (and adults) eat. Take, for example, French Food Rule #7: No random snacking. French government policy and pediatric advice are clear: children should eat three meals per day, plus one scheduled afternoon snack (the goûter). TV ads for snack foods even carry health warnings (like cigarettes here)! In the US, the increase in snacking over the past 3 decades–from an average of once per day in the 1970s to three times per day currently–is associated with an increase in caloric intake (and hence with higher obesity rates). Snacking has also increased in France, but is still much more rare than in North America. Of course, many other factors are relevant to a discussion of obesity: poverty (France has one of the lowest poverty rates in the G8) and food insecurity, exercise rates, food deserts, genetics, and obesogenic chemicals. But how much we eat is undoubtedly a factor (scientists term this a ‘positive energy balance’: too many calories in, and too few calories out). For example, French parents ask their children: “Are you still hungry?” rather than “Are you full?” — a subtle, but important distinction. And because they don’t randomly snack, French children get used to waiting between meals. They learn that that it’s OK to have a comfortably empty stomach—which enables them to eat reasonable quantities of the energy-dense foods served at mealtimes, so they don’t feel hungry until the next meal—creating a virtuous cycle. And here’s French Food Rule #6:’You don’t have to eat it, but you do have to taste it’. Research has shown that children have to taste new foods at least 7 times (on average) before they will accept to eat them; and further tasting is necessary before they’ll learn to like them. Knowing this, French parents are enabled to teach kids to love the tastes of ‘good-for-you’ foods (rather than telling our children that ‘good-for-you’ food tastes bad and then forcing them to eat it). Although they love fries and pizza as much as any kid, French kids also learn to like ‘healthy foods’. Of course, we didn’t do it on our own. My children were taught to learn how to eat, and thus to grow out of the picky eater phase, through ‘tasting lessons’ at school, food lessons in the curriculum, a school garden and varied school lunch menus (combined with positive peer pressure – as all of the children eat the same thing, and no one brings lunch from home). A two-hour lunch break ensured the French students had enough time to eat their four-course, freshly prepared meal properly, and then play—so they were recharged for the afternoon. Food was the highlight of the day; often, the first thing parents would ask at pick-up was: ‘How did you enjoy your lunch’ today? So French schools support parents in teaching children about healthy food culture—whereas here at home, it often seems like the opposite is true. And a range of other measures –incentives for fruit and vegetable producers, food industry regulation (including a soda tax), and controls on food marketing to children – are also in place. Of course, the French approach is not perfect. School lunches vary in quality, for example–and aren’t reflective of the country’s ethnic diversity (particularly when it comes to kosher and halal foods). And as in other countries, obesity rates are higher amongst low-income groups, and the gap is widening. Nonetheless, we can learn from the French approach to child obesity, for at least four reasons. 1. The French take a positive rather than punitive approach to food—teaching their children to love healthy food. This doesn’t mean that there aren’t picky eaters in France (of course there are!). But many pass through the ‘picky eater’ phase more quickly, and so are better equipped to make the right food choices—about how much as well as what to eat. Note: some research, like that of Brian Wansink at Cornell, suggests that providing children with extensive nutritional education is not sufficient to enable them to consistently make healthy food choices. 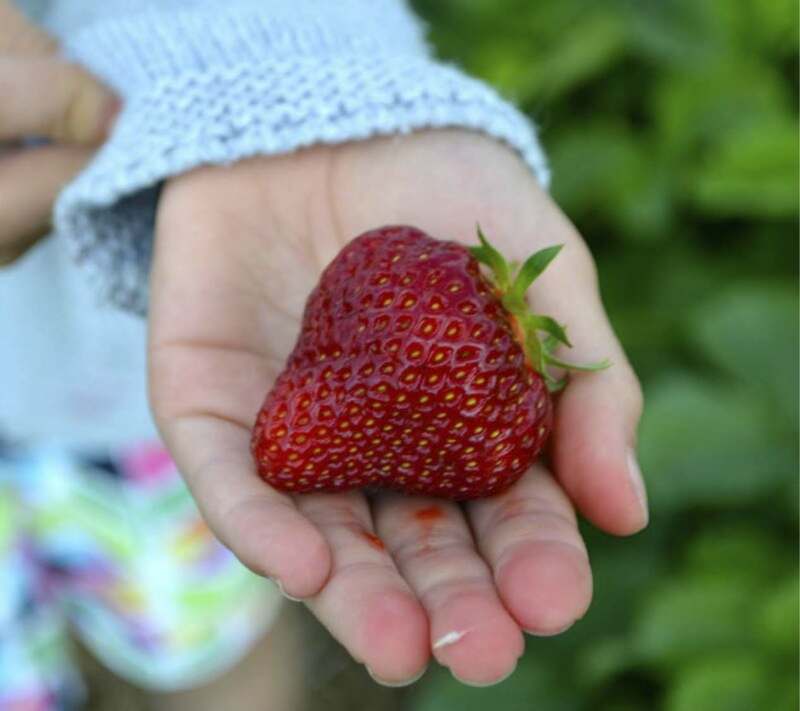 Nutritional education is important, but the French ‘pleasure principle’ is different: French kids (and adults) aren’t learning to eat healthy food because they have to, but rather because they enjoy it, and because it’s part of a routine they’ve followed since early childhood. 2. The French have taken a comprehensive approach to preventing child obesity–including many initiatives that medical professionals have long been demanding in the US. And this has measurable effects. Many of the policies describe above have only been in place over the past decade—initiated when the French government became alarmed by an increase in child obesity rates (albeit low by international standards). Since then, child obesity rates have leveled off. 3. Government support is crucial, but the French approach to food education is not solely top-down or government-led. French school lunches, for example, are entirely funded by local municipalities (there are no national subsidies, unlike in the US). Social solidarity within communities enables this to work; for example, income-related cross-subsidies between families ensure that all kids have access to the same healthy meals—so that middle-class families in Paris pay $3 per meal, but lower-income families pay only 20 cents. Policy change (revising SNAP, the Farm Bill, and the National School Lunch Program) is important – but so is bottom-up change, teaching kids (and their parents) to demand healthy food, and creating the conditions in which they can organize themselves to provide it. Luckily, we have great examples here at home: like Chef Kate’s ‘Cook for America’, which shows schools how to save money and improve lunches by scratch cooking ‘real food’ meals. In response to the often divisive American debate over whether ‘government’ versus ‘personal responsibility’ matters–the simple answer is: both. 4. Finally, while healthy eating starts in the home, food education should also be part of the school curriculum. Food can be integrated into everything from science to social studies. ‘Taste Training’ lessons start in kindergarten in France, and culminate in Grade 4 with a ‘Tasting Week’ (complete with certificate!). There are lots of great local initiatives across North America (including Project Chef in Vancouver, where we now live), but these are ad hoc and often under-funded. What about supporting and replicating these initiatives, or celebrating Food Day in American schools? These strategies might not be the solution to our obesity epidemic, but (properly adapted) they might be part of a solution. Admittedly, change in schools and government policy won’t happen overnight. In the meantime, however, parents can accomplish a great deal by applying the ‘French Food Rules’ at home – and creating their own family food revolution. Bio: Karen Le Billon is a Professor and Chair at the University of British Columbia. A Rhodes Scholar with a PhD from Oxford University, she was named one of Canada’s Top 40 under 40 in 2011. Her work has been featured on Good Morning America, the New York Times, the Sunday Times, the Toronto Star,Dissent, the Globe and Mail, and the Independent. 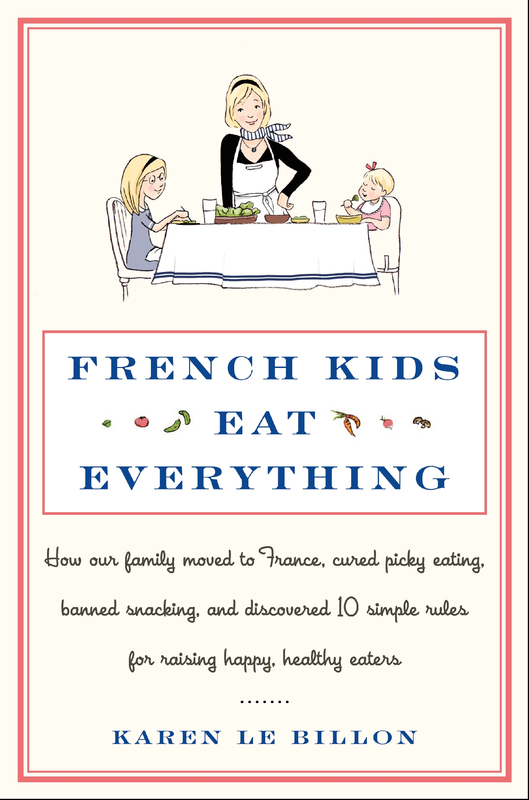 The author of French Kids Eat Everything(HarperCollins 2012) and a Real Food Advocate for the Jamie Oliver Foundation, Le Billon blogs on France, food, and parenting at FrenchKidsEatEverything.com. Saulais, L. et. Al. (2012) « Consumer knowledge about dietary fats: Another French paradox?” British Food Journal114(1), 108-120. P. Rozin, C. Fischler, S. Imada, A. Sarubin, and A. Wrzesniewski, “Attitudes to Food and the Role of Food in Life in the U.S.A., Japan, Flemish Belgium and France: Possible Implications for the Diet–Health Debate,” Appetite33 (1999): 163-180. • Insee, enquête Emploi du temps 2009-2010. • Strasburger VC, et al “Policy statement — Children, adolescents, obesity, and the media” Pediatrics 2011; 128: 201–208. This is one of our family’s favourite recipes (and one of the most popular recipes in French Kids Eat Everything!). It’s a French kids’ classic, and actually sums up a lot about the French approach to kids’ food: elegant yet edible, beautifully presented, easy and quick to make. 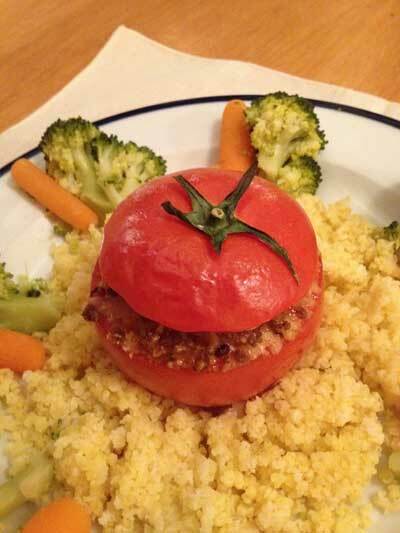 Tomates farcies (stuffed tomatoes) are both filling and fun. 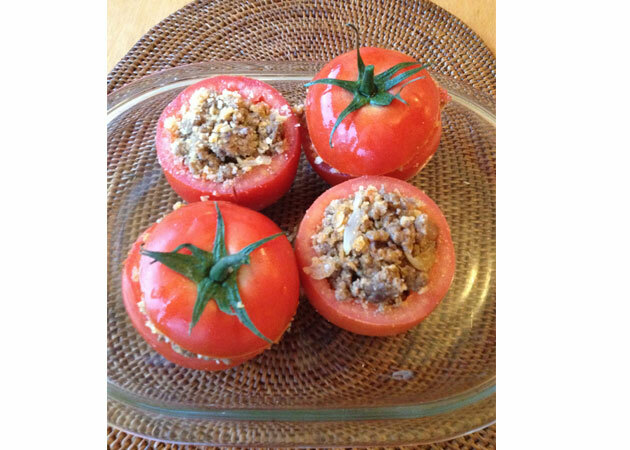 The tomatoes are hollowed out and stuffed (in this case, with a savory ground beef mixture), and then baked to perfection. The farce peeks out of the tomatoes in acoquettish sort of way, and children love lifting up the tomato “hats” to see what lies underneath. Served with something that can absorb the delicious juices (rice and couscous are our favorites), this is a complete and easy tasty meal. 1. Preheat the oven to 375 ̊F (200 degrees C). 2. In a large skillet, heat the olive oil over low heat. Add the onion and sauté until golden brown, about 5 minutes. Increase the heat to medium-high, quickly add the ground beef (to “seize” the meat), stir vigorously for 1 minute, and lower the heat to medium-low. Simmer the meat until thoroughly cooked, about 6 to 8 minutes. 6. Place the tomatoes in a baking dish, and bake for 20 to 25 minutes, or until they are deliciously melt-in-your-month (fondant). Cool for 5 minutes before serving. Lori was one of the devoted ‘test families’ for Getting to Yum, who has been blogging about kids’ food for the past couple of years. She’s had some inspiring experiences with teaching her children to love healthy food. In fact, she was so inspired that she’s been posting regularly about applying the Getting to Yum lessons with her own two daughters! A while back, Lori blogged about her experiences using positive marketing messages with her kids; this is a powerful approach that quickly becomes a (fun) habit, and can work wonders. Check out her great blog here!